Acadians, Anglophones and members of the Elsipogtog First Nation are working together to halt fracking in New Brunswick and — perhaps just as importantly — overcome the ugly history between settler and native groups. For the past two weeks, an unprecedented coalition of Acadians, Anglophones and members of the Elsipogtog First Nation have blockaded a compound in the Canadian town of Rexton, New Brunswick, where trucks and equipment used in the process of hydraulic fracturing, or fracking, are stored. The company that owns the facility — SWN Resources Canada — has been working all summer to conduct seismic tests as the first step in the fracking process. While the natural gas derived from the drilling would primarily be sold over the border in the United States, the impacts of extraction — namely polluted water and air — would be felt in these communities for generations to come. In New Brunswick, the provincial government owns all underground mineral and gas rights. The local people have little influence over their own land. In some cases, citizens only receive a written notice within 24 hours of seismic testing and drilling on their land. Realizing their lack of legal power in the decision-making process, impacted landowners began organizing in New Brunswick’s Kent County about three years ago, when shale gas companies moved in to start exploration. Groups like Our Environment, Our Choice and Upriver Environment Watch began educational campaigns — including speaking tours, lobbying the provincial and local governments, and public actions such as a blue ribbon campaign for clean water, where activists tied ribbons along the major roads in the area to publicize the issue. Denise Vautour, a local Acadian, got involved in the Upriver group after seeing the 2010 anti-fracking documentary Gasland. As a retired medical social worker, Vautour has focused on what she perceives as the immorality of exposing the populous to fracking. While the industry has claimed in local public meetings that fracking fluid is safe enough to drink, Vautour believes they are lying. Beyond the obvious carcinogens in fracking fluid, she has argued that even the best medical reports still need years-worth of evidence before the longterm effects of fracking on human and ecological health can be determined. Three months ago, Latour submitted evidence to the province surrounding the moral complications of continuing to pollute water and air without prior and informed consent. However, she has yet to receive a response because government offices are sifting through thousands of submissions from New Brunswick residents in opposition to fracking. Even with such widespread opposition, the sentiment at the encampment is that more people should be taking action on the ground in order to make a difference. While at times the camp swells to a few hundred people — such as during press conferences or mealtimes — it dwindles again during the cold nights to around 20 people. Independent of numbers, though, the coalition is dedicated and has thus far forced SWN to spend tens of millions of dollars more than expected. 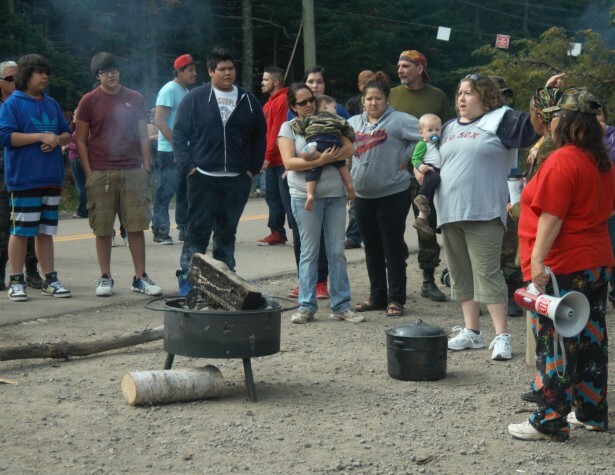 Since the beginning of the summer, the Mi’kmaq sacred fire has become a place for French-speaking Acadians, Anglophones and members of the Elsipogtog First Nation to gather and organize actions. It was around this ceremonial fire that people from all three groups built their alliances, learning to work and pray together. Despite the cruel history between settlers and natives, all parties have joined together to become nonviolent protectors of the water and land, meeting the fracking industry at every turn — monitoring, blockading and otherwise putting their bodies on the line to stop shale gas development. Much of the activism so far has focused on blocking the so-called “thumper” trucks, which send vibrations through the ground — similar to an earthquake — to help determine where to drill. In June and July, 30 people were arrested for blocking backwoods testing sites. On July 24, after months of direct action, as well as standoffs with the police, the Geptin of the Mi’gmag Grand Council — the pre-contact traditional form of government in Mi’kma’ki that still exists today — issued an eviction notice to SWN. Following negotiations between the Royal Canadian Mounted Police and representatives of Elsipogtog First Nation and the Mi’kmaq Warriors Society, SWN agreed to stop testing in the backwoods of New Brunswick at the end of July, and announced it would resume in mid-September with testing in lower lying areas. But the encampment that began two weeks ago has thus far prevented SWN from proceeding. Employees may be attempting dynamite testing elsewhere, but the activists in Rexton and the neighboring towns are paying close attention, waiting for any sign of activity. The response from SWN, the provincial government and the mainstream media has not been favorable. Even though every action so far has been nonviolent, much of the attention has focused on the Warriors Society, which plans to use any means necessary to stop fracking on Mi’kmaq territory. SWN refused to meet in person with the blockaders, choosing instead to file a civil injunction for the forced removal of the encampment. Most days at the encampment now include a talking circle, where every person has a chance to speak their mind and suggest ideas for moving forward. Many of the conversations focus on strengthening the alliances between groups and working together. However, some questions remain. How will the community respond if the injunction is served? Is SWN continuing testing in other areas while the blockade is underway? What is the best strategy to end fracking here in New Brunswick once and for all? To answer these questions, people are grounding themselves in the sacred. The Eight Women of the Eighth Fire are a group of Mi’kmaq women who have come together to provide guidance. The women honor both the Mi’kmaq tradition of female leadership as well as the Seven Fires Prophesy — first heard by the Mi’kmaq and Anishinaabe peoples — which states that if enough people from all races and creeds turn from the life of extreme materialism, then environmental and social catastrophe will be averted. Using ceremony and prayer, the Eight Women will help guide decision-making and honor the reasons that brought people together in this struggle — to protect the water, the earth, treaty rights, indigenous sovereignty and harmony between the races. While the way forward has many unknowns, the people that gather daily at the encampment remain positive. Earlier this month, dozens of students from a nearby school left class to support the encampment, joining the crowd in chants and songs.